Wealthy Chinese are sinking billions of dollars into Puget Sound area real estate, and by doing so they’re making a clearcut business case for protecting the environment and spending money on education. The influx of foreign buyers, mostly Chinese were one of the top real estate stories of 2014. It’s not just that many foreign nationals are buying here. Rather, it’s how they’re executing transactions, with some paying all cash for pricey assets. Experts predict that the trend will continue. According to the National Association of Realtors, China has more than 2 million millionaires, and that 47 percent plan to move out of the country in the next five years. HUD just released a mortgage letter (15-01) that announces a rate reduction for FHA’s monthly mortgage insurance premium. This rate reduction is effective with all FHA case #’s issued after January 26th. That means that new homebuyer’s payments will be lower!! Real estate brokers around Western Washington reported a strong finish to 2014. December’s sales outpaced the same month a year ago by double digits, according to new figures from Northwest Multiple Listing Service. December was one of the best Decembers on record. MLS members reported modest year-over-year price gains (about 5.5%) for homes and condominiums that sold last month compared to 12 months ago. The number of new listings added to inventory was nearly identical to activity of a year ago, but with pending sales outpacing new listings, the selection, as measured by total active inventory, dwindled by about 8% compared to a year ago. Prices, interest rates, and rents will continue to rise. The cost of buying a home is not determined by price alone, but by price and the mortgage rate. The longer a buyer waits, the higher the mortgage payment as prices and interest rates continue to increase. MLS members reported 5,794 pending sales (mutually accepted offers) for an increase of nearly 11% from the year-ago total of 5,224 pendings. In the four-county Puget Sound region, brokers notched 4,410 pending sales, the highest December volume since 2006. High-end homes are selling well, according to brokers and MLS data. Above the one million dollar price point in King County, we have seen back to back years of very strong activity. Northwest MLS figures show nearly 2,000 homes priced at one million dollars and up sold in King County during 2014. That’s up more than 25% compared to 2013. For more modestly priced homes, first-time and move-up buyers are taking advantage of loosening lending standards. In December our brokers experienced high open house traffic and strong demand from buyers as listing inventory declined. MLS figures show there were 4,367 new listings added to inventory during December 2014, about the same as a year ago when members added 4,333 homes to the selection. At month end, there were 17,659 homes and condos for sale. That’s down nearly 8.1% from the year-ago inventory of 19,214 active listings. Brokers are reporting tight inventory in several neighborhoods, particularly around job centers. All this sales activity has eaten even further into already low inventory levels. MLS figures show about 2.8 months of inventory system-wide. Of the 21 counties in the monthly statistical report, King County has the tightest inventory, with only 1.4 months of supply. Prices climbed nearly 5.5% from a year ago, rising from an area-wide median selling price of $275,000 to last month’s figure of $290,000. That matches the price reported for October’s sales, a figure that was only surpassed in July when the median sales price overall was $300,000. While some recent reports indicate a cooling of appreciation in 2015, unless more inventory hits the market, the anticipation would be that the percentage increased to be about the same as 2014 due to sustained demand. If sellers are serious about getting their homes sold, it is not a good idea to ‘go fishing’ even though there may be high demand. Buyers are serious about making a purchase, but they are in no mood to play games as they are well educated regarding price. If the house is overpriced- even by a small amount – buyers will simply not make offers. Fannie Mae’s recent National Housing Survey. Its research shows 44% of consumers say now is a good time to sell a house, an all-time survey high. Follow Mark's board Washington State Real Estate - ReloWashington.com on Pinterest. This has to be one of the greatest privately landscaped properties in the Pacific Northwest. It resides on 47 separate land parcels which total 525 acres with 8 homes and many appurtenant outbuildings. The properties distinguishing feature is a horticultural collection totaling over 3000 planted trees, including 200 different varieties of evergreen and flowering trees and over 100 different rose varieties. Additionally, there are hundreds of different rhododendrons, shrubs, plants and perennial flowers from around the world. This “landscape art sanctuary” also includes several private lakes, six uniquely constructed bridges, water features and 8 miles of hiking and horseback riding trails. There is a driving range, chipping & putting area to PGA Standards and horse and cattle pastures. If that is not enough, there is also a private 2200 foot landing strip for planes and a roll away helicopter landing pad to a private hanger for daily commuting. This property has all the amenities of a World-Class Ranch while being located just minutes from Seattle and SeaTac Airport. Just a readers digest version of the Space Needle fireworks display for the New Years celebration – in HD 2015! Happy New Year! If you want to know which neighborhoods in the Puget Sound region have the best schools, check out this top 10 list here. It should come as no surprise that some of the top elementary schools in the state of Washington are also some of the most appealing areas, including Bainbridge Island, Bellevue and Kirkland. But some of the other top-performing elementary schools might surprise you. Great schools are scattered throughout the state. The State Board of Education releases its school achievement index every year. The index looks at student test scores, graduation rates and other factors to determine how schools across the state are doing and to identify schools that may be struggling. This ranking is based on that index from the 2012-13 school year, and only includes those schools that make the highest-ranked category, with a score of between 8 and 10. Having a positive work-life balance has more variables than just what job you have; another key component is where you live. Bloomington, Indiana, is the top ranked city in this year’s ranking of the best cities for work-life balance, according to the finance site NerdWallet. Home to Indiana University, the top employer in the region, Bloomington was crowned the best city for work-life balance because of the low number of average weekly hours worked, as well as its shorter average commute times. “Workers who seek a healthy work-life balance can reduce stress and improve the quality of their lives,” Divya Raghaven, a strategy associate at NerdWallet, wrote on the company’s blog. NerdWallet figured its rankings of 536 U.S. cities based on four factors – 1 – the mean hours worked per week by an average employee in each city – 2 – the average daily commute time – 3 – the median earnings for full-time, year-round workers and 4 – the median rent in each city. 1 – Provo, Utah — Employees in Provo average 30.9-hour workweeks, the lowest of all the 536 cities in the study. Brigham Young University is located in Provo and is among its top employers. 2 – Gainesville, Florida — The average Gainesville employee works just 32.5 hours a week. A major employer there is the University of Florida, the eighth-largest university in the United States. 3 – Eau Claire, Wisconsin — In addition to a workweek with fewer hours, Eau Claire employees spend less time commuting and have a relatively low cost of living. The home-improvement chain Menards is headquartered in Eau Claire and is one of the city’s major employers. 4 – Tuscaloosa, Alabama — Besides being home to the University of Alabama, Tuscaloosa is a manufacturing, service and retail hub. Employees there average just 33.1-hour workweeks. 5 – Iowa City, Iowa – Employees in Iowa City work an average of 34.1 hours a week and spend just 17.2 minutes on their daily commute. The University of Iowa is the largest employer in Iowa City. 6 – College Station, Texas– College Station is home to Texas A&M University, one of the largest institutions for higher education in the nation.Residents there work an average of 34.1 hours each week and have an average commute of 17.1 minutes. 7 – Eugene, Oregon – Employees in Eugene work an average of 34 hours a week and have median earnings of $42,288. Top employers in Eugene include PeaceHealth Medical Group and the University of Oregon. 8 – Bellingham, Washington — Workers in Bellingham spend an average of 33.4 hours a week on the job and have average commute times of just 17.5 minutes. 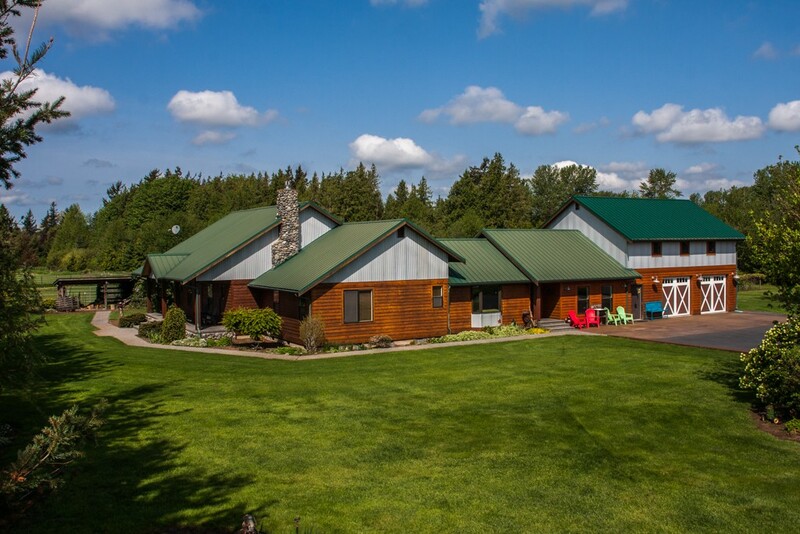 45 plus acres of berry ground with 2 immaculate custom homes. Accessory dwelling is 1348 sq ft built in 2002. Water rights included. Multiple outbuildings all in excellent condition. This property would also be excellent horse property. 9 – Kalamazoo, Michigan — Employees in Kalamazoo work an average of 33.6 hours a week and spend an average of $866 a month on rent. Kalamazoo is home to companies in the pharmaceutical, life sciences and manufacturing industries. Of course, then there are the cities that ranked among the worst for work-life balance, which included Dale City, Virginia; Waldorf and Germantown, Maryland; Menifee and Tracy, California; and New York City. Yesterday was the Seattle Seahawks first day of training camp here in Renton. All 12th Man fans were anxiously anticipating their arrival and the display of new and old talents. Of course, there was the inevitable hold out, who did not grace the field with his presence. But, for those who know that those issues will eventually work their way out – we remain focused upon those who are present and ready to show their wares. The main attraction for me, though, was the man at the helm, Russell Wilson. And he did not disappoint, as you will see – with his display of his Super Bowl Championship power shuffle. Own your own PRIVATE 29+ Acre Island in the San Juan’s of the beautiful Pacific NW! 360 degrees of water & forest views. 4230′ saltwater frontage w-tidelands. Architectural excellence w-contemporary design, superior quality and top of the line rich finishes throughout makes this a truly SPECTACULAR home. Completely self-sustained environment…power & water. 1200 SF quality care takers cottage w-full shop below. 60×60 boat dock, to accommodate yachts & seaplane w-5000 diesel storage. This private island estate is entirely self-sufficient and has been named Trump Island (as far as I know – not THE Trump you may be thinking) in the San Juans is on the market for a measly $8.75 million. But, what do you get for that price tag is – 29.4 acres of land which boasts a more than 7,000 square-foot custom home with six bedrooms and four bathrooms, amazing views in perpitutiy, a 1,200 square-foot caretaker’s cottage, dock for a sea plane and yacht (clearly you probably already have those), waterfront access and your own forest that you should rename something which identifies with your unique and island owning personality.